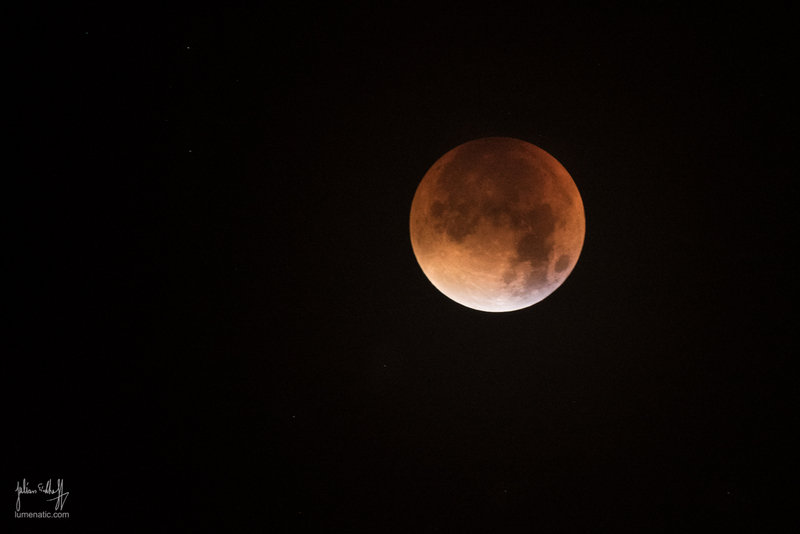 There has been an extensive coverage of the recent lunar eclipse (bloodmoon). I also headed out in the middle of the night to photograph that event. The night before I prepared everything in such a way, that I just had to get up in the night, jump into my clothing and motorcycle gear, take the backpack and head out. I used my Nikon D750 with the Tamron 150-600 mm lens and a MeFoto compact tripod. The location I chose is a small artificial hill near the Hanover fair grounds (former Expo 2000 site). We don’t have any mountains here in the Hanover region, so I reckoned that the hill would make a good observation point. The eclipse startet somewhere around 3 AM, with the “bloodmoon phase” occuring from 04:11 AM. Since I had to go to work that day (it occured the night from Sunday to Monday) I opted to skip the partial eclipse phase and only shoot the blood moon. I got up at 3:30 AM, jumped into my stuff and onto my motorcycle. I rode 14 km to the hill and set up my tripod. It turned out I was far from being the only one who chose that location. In the time I stayed at the location (4 AM – roughly 5 AM) about 10 people came and went. I took the first image at 4 AM, while the moon was already mostly red with only a small white strip at the bottom. I continued shooting for another 15 minutes, then thick fog came up and the moon was hidden. The shooting was over. I managed to take 27 photos with 8 “keepers” in terms of quality. But since all those keepers showed the same moon I chose only to show one of them. To illustrate how thick the fog was here is a shot of the former Expo 2000 site. The building on the right is the ruin of the dutch pavillon. It was never demolished or reused as nobody was reponsible for it. Looks a little like an alien spaceship that landed right here. The fog became even thicker, so that the pavillon (around 600 m from the hill) became invisible. 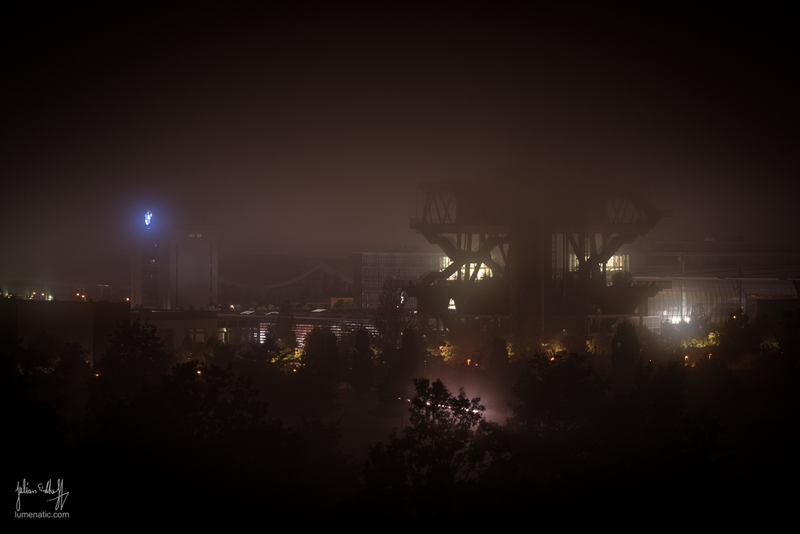 I stayed at location until around 5AM, hoping the fog would clear. But as it became thicker by the minute I packed my stuff and mounted my bike again. A very foggy and unpleasant bike ride later I entered the office at 05:45 AM. I brewed a strong coffee and started my week.